The gesture of the laying on of hands was an important part of Jesus healing the sick. He also commissioned his disciples to do so in his name. The laying on of hands remains essential to the sacrament of the Anointing of the Sick. Through this sacrament, those of any age being tried by illness are strengthened by God’s grace. While it is commonly used for those approaching death, an anointing is not limited to such moments. Any member of the faithful undergoing serious physical or mental illness, or preparing for surgery, or suffering advanced age, may receive an anointing. It’s a sacrament that can be received more than once. 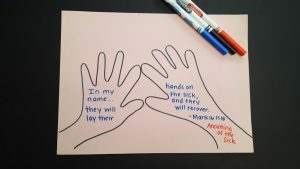 This craft focuses on the connection between the Scripture where Jesus commissioned his disciples to heal in his name and the priestly laying on of hands during the Anointing of the Sick. 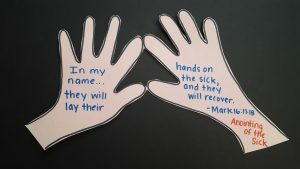 Through dialogue and reading Scripture, students will see the importance of the laying on of hands both then and now. 1. Select a piece of construction paper and a pencil. Set both hands on the paper so that the thumbs and pointer fingers are touching. They should form an upside down heart. 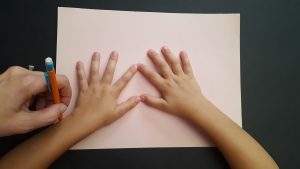 Have a partner help trace around the hands with a pencil. 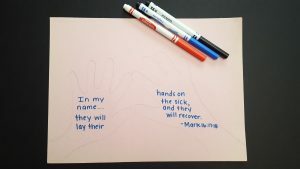 Depending on the size of the students’ hands, they may need to adjust the spacing of the words or divide up the Scripture passage to make it fit on both hands. 3. Use the scissors to carefully cut around the hands. 4. Discuss the Anointing of the Sick and what the priest does during the sacrament: lay hands on the sick, pray over them, and anoint with blessed oil (see CCC, 1519.) How is this similar to the way Jesus and his disciples healed? ■■ Students can find the Scripture passage on their own and copy it directly from the Bible. 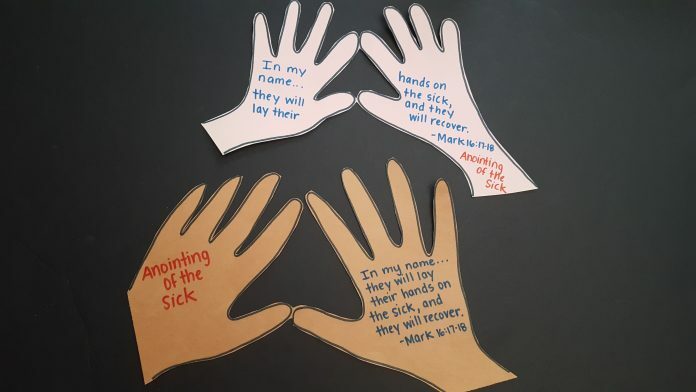 ■■ On the back of their hand cutout, invite students to write a prayer for a family member or parishioner that has had an anointing recently or maybe is in need of the Anointing of the Sick. Loving Father, we thank you for your healing touch. Help us to know that we are never alone in our struggles. We pray for those who need your healing power, that through the Anointing of the Sick, they will receive graces that will strengthen them and offer peace. Amen. SARA JONCKHEERE, MA, is an elementary school teacher turned work-at-home mom. Creating digital curriculum and resources, she shares teaching ideas at SaraJCreations.com. This article was originally published in Catechist magazine, February 2018.